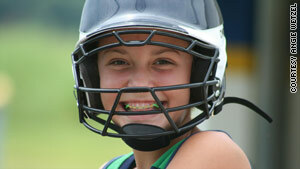 Mackenzie Riley, 13, played through pain until she got medical help. Now she has special shoes to prevent future injury. (CNN) -- Mackenzie Riley is only 13 years old, but her schedule is busier than many adults. Besides being on her middle-school yearbook staff and taking piano and voice lessons once a week, she is also the co-captain of her seventh-grade basketball and volleyball teams. "I like playing sports a lot," Mackenzie says. "I like the teamwork and having us all come together." This year she is also adding softball and track to the mix. Mackenzie's parents, Todd and JoAnna Riley, attend many of her games, so during last year's basketball season they knew immediately when something was wrong. "We noticed that as she was playing she asked to sit down more, which is not something she typically wants to do," recalls JoAnna Riley. Mackenzie started complaining of pain and bruising in her foot during the games, but she often felt better afterwards, so her parents didn't think much of it. "We thought we could treat it on our own," admits JoAnna, "so we gave her anti-inflammatory and pain relievers to help those aching bones." But Mackenzie continued to have problems and her parents' concerns grew. "The longer it went on, the more we thought it wasn't something that was going to go away on its own." Halfway through the season, the Riley's decided it was time to see specialist. Mackenzie got a diagnosis of plantar fasciitis, a condition that develops gradually over time and is most common in people between ages 40 and 60. But for Mackenzie, the condition developed despite her young age due to a combination of her being flat-footed and from overuse from continuously playing sports that put a lot of stress on her feet. According to Safe Kids USA, more than 30 million American children participate in extracurricular sports each year, and the American Academy of Orthopedic Surgeons estimates that more than 3.5 million children age 14 and younger seek medical attention each year as a result of sports injuries. Dr. Charles Giangarra, chief of athletics and orthopedic sports medicine at Marshall University in West Virginia, and the physician who treated Mackenzie, says the push to be competitive is causing "significant problems" in young people. He says his practice is seeing more and more pediatric patients with serious injuries previously associated with adults. But that's not all. "It's not uncommon for me to see a 10-year-old whose parents ask me to give them permission to play in the youth football championship -- because another doctor has disqualified the child due to an injury," Giangarra wrote in an email. Let's face it though, what parent doesn't at least wonder if their little leaguer could be the next Derek Jeter or their little gymnast the next Shawn Johnson? "We have to remember, though, that a child is not just a small adult" says Dr. Paul Sethi, president of the ONS Foundation for Clinical Research and Education, a group that works to prevent sport injuries in young athletes. "It's not a good idea to play the same sport all year long," warns Sethi. He says having your child play several sports which work different parts of the body helps avoid overuse injuries. "If your child plays tennis for half the year, then consider putting them in soccer the other half of the year," he says. Dr. Charles Metzger, an orthopedic surgeon and author of a recent study looking at overuse injuries in minor league baseball players, advises that "if you know your child is taking Motrin or Tylenol to soothe pain, take them out of the game." He says "playing through pain" means the underlying problem is not being addressed, which can lead to future complications. Giangarra has another way of looking at it. "If you're experiencing pain, then whatever being done is either being done wrong or your body is not handling it," he says, adding "It's your brain's way of protecting you." In a study presented this year at the American Academy of Orthopedic Surgeons conference, researcher Dr. Charles Metzger found that of children ages 7 to 15 involved in youth baseball for one season, 14 percent had developed problems with in the ligament that helps in the rotation of the shoulder, a precursor to the more serious injuries such as labral tears, painful injuries to the shoulder joint often seen in Major League Baseball players. "There's nothing as detailed as this for other sports," says Dr. Cynthia LaBella, medical director for Children's Memorial Hospital's Institute for Sports Medicine in Chicago. "So certainly a parent who is proactive can go to the game, get out their counters and keep track from the sidelines." The group Stop Injury Now has tips for how to prevent overuse injuries in other sports. "If you can't attend an event, your child's care is usually the responsibility of the coach," says Giangarra. He encourages parents to ask the coach specifically about his or her philosophy on dealing with an injury. • What is your experience coaching a child with an injury and how did you handle it? • What is your philosophy on informing the parent when a child complains of pain? • Do you have any previous medical experience? "If a coach is afraid to answer such questions, this could be a serious red flag for the parent," Giangarra says. Children have growth plates in areas like their shoulders, knees, elbows and heels that have not yet fused and often are affected by the sports they play. If they are damaged, it can lead to permanent damage. Knowing the types of injuries common in your child's sport(s) can help you observe the early warning signs of injury, and where to look for them. "Sports involving running, cutting, jumping and quick changes in direction are associated with lower-extremity injuries, just as sports involving overhead activities usually are associated with upper extremity injuries," explains Giangarra. • Baseball: May develop pain in the elbow and shoulder. • Soccer and football: May develop pain in the ankles, knees and heels. • Gymnasts: May develop pain in the wrists. • Tennis: May develop pain in the shoulder. Becoming familiar with these is a good idea, but experts warn against looking only for injuries in these areas, especially if your child plays multiple sports. "Anytime they complain of pain, especially in the joints, they should be evaluated," says LaBella. No matter where the problem is located, if it returns after they rest, get them checked out, she says. As for Mackenzie Riley, the condition she had, if left untreated, could have led to lifelong chronic problems or initiated other issues in the foot, knee, hip or back, which could potentially keep a thriving young athlete out of the game for good. Fortunately for Mackenzie, her injury was caught before it turned into something more serious. Now she has to do more stretches and wear special shoes to help prevent more injury, and she has to take seasonal breaks between sporting activities. Mackenzie is taking it all in stride. "I had to cut back a little bit, but I know that in order for it to get better taking a break is something I have to do."